Monitors the tire pressure while you are driving. If your vehicle’s tire pressure becomes significantly low, the low tire pressure indicator comes on. Conditions such as low ambient temperature and altitude change directly affect tire pressure and can trigger the low tire pressure indicator to come on. 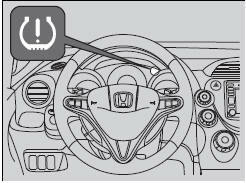 Tire pressure checked and inflated in: • Warm weather can become under-inflated in colder weather. • Cold weather can become over-inflated in warmer weather. The low tire pressure indicator will not come on as a result of over inflation.